Representatives of more than 60 countries meeting in Tokyo welcomed Friday the formation of the National Coalition of Syrian Revolutionary and Opposition Forces. 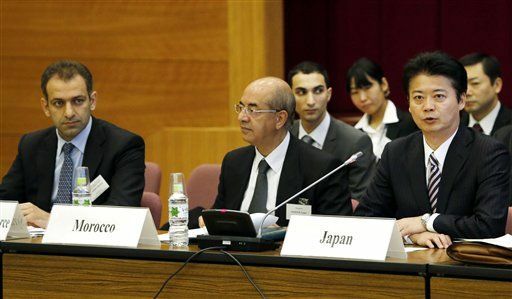 At a meeting in the Japanese capital, the group's fifth since its inception, they called for a full oil embargo on Syria. Presently, the United States bans the import of Syrian oil and gas, but the European Union does not. 1. The Friends of the Syrian People International Working Group on Sanctions (‘the Group’) held its fifth meeting in Tokyo, Japan, on 30 November 2012. Under the mandate given by the Ministerial meeting of the Friends of the Syrian People in Istanbul on 1 April, the meeting built upon and endorsed the outcomes of the meetings held by the Group in Paris on 17 April, in Washington, D.C. on 6 June, in Doha on 19 July, and in The Hague on 20 September. Japan, Morocco, and EEAS (European External Action Service) co-chaired the meeting. On behalf of the host government, Mr. Koichiro Gemba, the Minister for Foreign Affairs of Japan, delivered the opening address. 63 countries as well as the League of Arab States, the Gulf Cooperation Council, and the European Union were represented at the meeting. Also present was the Syrian Economic Task Force, who attended on behalf of the National Coalition of Syrian Revolution and Opposition Forces. The Group welcomed the participation of four new countries, including three from Asia, further underlining the international community’s growing determination to bring about an end to the repression and a political solution to the crisis in Syria as soon as possible. 2. Gravely alarmed by the escalation of violence in Syria, and the spillover of the crisis into the entire region, the Group condemned in the strongest terms the incessant killings, bombings of residential areas, and destruction as well as the systematic and gross violation of human rights in Syria, and reiterated its call for the Syrian regime, in the first place, to stop the violence. It also called upon those countries, groups and individuals that are actively supporting the Syrian regime’s ruthless efforts to suppress the political aspirations of the Syrian people to cease their support. 3. The Group deplored the further deterioration of the humanitarian situation in Syria, called upon the Syrian regime to grant full and unimpeded access for all affected civilians to humanitarian assistance, and urged the international community to respond to appeals by the United Nations and its humanitarian partners and provide urgent financial support to address the growing humanitarian needs of the Syrian population, both for the civilians in Syria affected by the conflict and for Syrian refugees in neighboring countries, which are bearing the major burden in this regard. 4. The Group is committed to the sovereignty, independence, national unity and territorial integrity of Syria. The Group reaffirmed its unwavering support for the rightful and legitimate aspirations of the Syrian people for a peaceful, democratic, pluralistic, and inclusive society, free of any sectarianism or discrimination on any grounds, and committed to stand by them until their aspirations are fulfilled. In this regard, the Group expressed its full support for Joint Special Representative of the United Nations and the League of Arab States, Lakhdar Brahimi, for his assiduous efforts to bring about an end to the conflict and achieve a peaceful transition to building the new Syria in a swift manner. In this respect, the Group noted that the Arab League has urged the Security Council to pass a resolution pertaining to declare an immediate cease-fire. 5. The Group welcomed the results of the Doha meetings on 11 November 2012 and the formation of the National Coalition of Syrian Revolution and Opposition Forces, encouraged them to prepare for a prompt, peaceful, and inclusive transition, and urged other opposition factions to join the Coalition so as to create an inclusive and all embracing body. It looks forward to working with this newly designed opposition umbrella organization in order to enhance the effectiveness of the restrictive measures. 6. While the responsibility for the violence lies with the Syrian regime, the Group condemned all terrorist acts in Syria, which undermine the objectives of the National Coalition of Syrian Revolution and Opposition Forces and further perpetuate the conflict in Syria. 7. The Group called on all members of the international community, especially members of the United Nations Security Council, to take swift, responsible and resolute action in solidarity with the Syrian people and to increase pressure on the Syrian regime by implementing and enforcing measures to deny it access to the resources needed for its violent campaign against its own population. 8. The Group welcomed the targeted and coordinated sanctions implemented by Group member countries and organizations to increase pressure on the Syrian regime and isolate it from the international community as a means of ending the repression in Syria. These measures have helped to hamper the ability of the Syrian regime to crack down on the Syrian people, inter alia, by cutting off major sources of income previously derived from the export of oil and other goods, by freezing the assets of those involved in or supporting the repression of the Syrian people, and by exercising vigilance to prevent the transfer of weapons and related goods to Syria. The Group recognized that a continued concerted multinational effort is necessary to further isolate the Syrian regime and deprive it of the financial resources and support needed to sustain its campaign of violent repression of the legitimate political aspirations of the Syrian people. 9. The Group renewed its commitment to improve the implementation and the enforcement of those sanctions already in place and to exercise enhanced vigilance to prevent evasion of sanctions by the Syrian regime, including by seeking alternative markets for its crude oil, and urged international partners not to purchase Syrian oil and gas products. The Group reiterated its resolve to ensure that sanctions against the Syrian regime and its affiliates are effectively implemented to hasten the end of the regime’s oppression of the Syrian people. In this regard, the Group commended the efforts of Syria’s neighbors to impose sanctions against the Syrian regime despite adverse effects on their own economy and called for other countries, including those neighbors of Syria that have not implemented restrictive measures, to impose similar sanctions. 10. With a view to reinforcing the effectiveness of current sanctions and increasing pressure upon the Syrian regime, the Group called on all states to take steps, in their own capacity, by imposing, at a minimum, an asset freeze on senior Syrian regime officials involved in the repression, as well as an asset freeze on, and restrictions on transactions with, major banks tied with the Syrian regime such as the Central Bank of Syria, the Commercial Bank of Syria and the Syrian International Islamic Bank, in order to prevent circumventing measures adopted by the Syrian regime. 11. The Group reiterated its call on all states to impose an embargo on Syrian petroleum products and a ban on the provision of insurance and reinsurance for shipments of Syrian petroleum products. The Group also reiterated its call on all states to impose a ban on arm shipments and military technical assistance to Syria and on the provision of insurance and reinsurance for third country arms shipments toward Syria. 12. The Group called on the international financial and business communities to diligently comply with ongoing and forthcoming measures against the Syrian regime. The Group strongly encouraged institutions and enterprises in those countries that have not joined the international sanctions regime to refrain from engaging in business with entities affiliated with those responsible for and contributing to the violence in Syria, or risk being exposed to a severe reputational risk. 13. The Group emphasized that sanctions do not target the civilian population of Syria but are aimed at the Syrian regime and its supporters. Expressing its solidarity with the Syrian people, the Group steadfastly maintained that the current and forthcoming measures are carefully targeted, including by reinforcing well-designed exceptions for humanitarian transactions satisfying the needs of the civilian population in Syria, so that innocent citizens of Syria do not suffer unjustly and unintentionally from these measures. The Group underlined that the economic hardship faced by the Syrian people is the consequence of the policies and actions of the Syrian regime. 14. The Group commended the courage shown by those who have defected from the Syrian regime and committed to promptly lift sanctions against them, as appropriate. The Group called on all those working for the Syrian regime, the armed forces and the financial and business community to distance themselves from the regime and support the legitimate aspirations of the Syrian people, or face further isolation from the international community and the international economic and financial system. 15. The Group agreed that there is an increasing need for the Syrians and the whole international community to prepare for the future reconstruction of Syria. In this regard, the Group called upon members to be prepared to swiftly review and lift sanctions including in key economic sectors, where appropriate, in a coordinated manner when a credible and irreversible transition process moves forward, in order to eliminate obstacles to the recovery and development of the Syrian economy and facilitate efforts to rebuild the country, including through the recovery and return of assets misappropriated by the Syrian regime and its affiliates. 16. The Group also stressed that, for a swift, peaceful, and inclusive transition and successful reconstruction, the Working Groups on Sanctions and on Economic Recovery and Development should continue to progress in tandem and expressed its will to maintain close coordination between the two Working Groups. 17. The Group committed to continue to share information on measures taken to increase the pressure on the Syrian regime. Recalling the call by the Group to establish ways to ensure continued coordination in between meetings, it thanked the Netherlands and the United States for publicizing the current sanctions regimes and the list of competent authorities, which will be updated as needed. 18. The International Working Group on Sanctions will hold its sixth meeting in Bulgaria in February 2013.